Like most countries influenced by western culture, Christmas is a time of celebration in South Korea. The iconic Salvation Army red kettles appear at major thoroughfares and Christmas songs and decorations fill the streets. Christmas-theme merchandise, and advertisements for them, fill the shelves and the airwaves. The typical Christmas scene in downtown Seoul could be from any major metropolis around the world. And, just as it has in the West, the days when Christmas was a strictly religious festival are long gone. The fading of the religious tint from Christmas celebrations may be accelerated in Korea by the country’s irreligious population. South Korea, despite the countless neon crucifix-adorned churches, is one of the world’s least religious nations, with more than half saying that they are irreligious. Christians of various denominations number about 13.4 million, or about 27 percent of the South Korean population in 2015, according to Statistics Korea. “The year end, in general, is usually quite busy but around Christmas you really should call and reserve a cab, particularly in popular areas like Hongdae,” Kim Dae-young, a 62 year old taxi driver, said. He added that although earnings are good during this time of the year, he doesn’t fully agree with the materialistic culture that seems to hold sway in Korea. Cashing in on the atmosphere, many restaurants often offer Christmas menus specifically arranged for couples. Despite prices that are often much higher than usual, trendier establishments require reservations, if not weeks in advance. 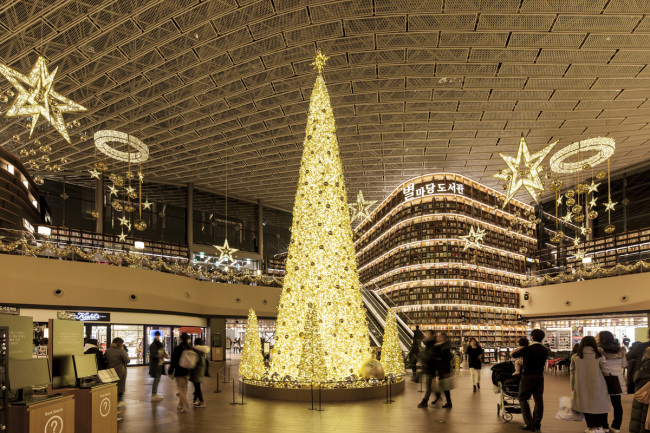 As the Christmas season also overlaps with year-end parties -- both personal and work-related -- that many Koreans consider a must, December is the season many small businesses look forward to. “About an hour is the normal waiting time. It’s Christmas, nobody seems to want to leave, particularly since they are using company money,” Chang Sang-hyung, a staff at a popular watering hole in southern Seoul said. While such commercial and secular celebrations may set the tone of the Christmas season for the general public, some Christians taken an entirely different approach. Churches of various denominations hold charitable events such as fund raising campaigns around this time of the year, and hold special services. “On Christmas Eve, we gather at the church to attend service, and for a range of events like secret Santa and general celebrations,” Jang Ha-young, a 30-year old professional interpreter, said. For others, Christmas is a holiday for the family, regardless of religion. “I will be going on a trip to Japan with the family this year,” Jun Min-suk, a 36-year old project manager visiting Korea for the holidays, said. He added that he thinks Christmas should be about family, and that while celebrating as couples, and with friends may be fun, the crowds and higher than usual prices put a damper on things. “(Christmas) really doesn’t concern me. I am not a Christian, so I really don’t see why I should get involved in any way,” a 39-year old office worker, who identifies himself as an antitheist, said declining to be named.